I’m always a little bit jealous of people who work full time as farmers, growers or gardeners. Sure, the pay is terrible and they can’t put things off just because it’s raining. But they get to devote themselves to what they love. They can do what needs to be done when it needs to be done, rather than putting it off for weeks at a time because other things get in the way. I appreciate that I’m perhaps idealising the horticultural life a little too much here. I also recognise that such a career has more than its fair share of ups and downs. But in the last couple of weeks, I’ve tried to introduce some of this ethos – of working to the plants’ timescales, rather than to my own – into how I relate to my own little patch of earth. I’ve stopped thinking of it as a tatty greenhouse and a few raised beds, and started thinking of it as a micro-farm. My next step has been to devote an hour each morning, as soon as I’ve got back from walking the dog, to working through some of the tasks on my list. So far, this ‘little and often’ approach has been rather enlightening, giving me a real feeling of satisfaction as I storm through the huge number of tasks that have been bugging me for ages. It also leaves the weekends, which I’d usually use to try to catch up on absolutely everything I needed to do in the garden, for larger projects, like building a new cold frame. 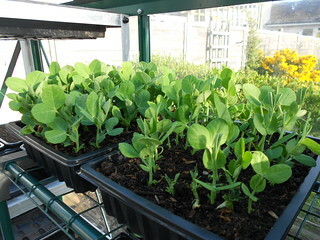 I’ve now got all of my seeds planted, except for the ‘sow in mid-May’ ones, which are on the list for this week. Here are just a few of them. 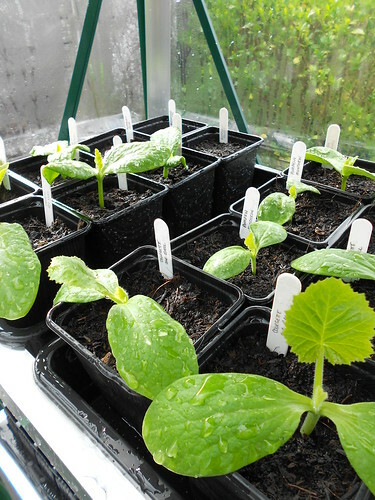 The courgettes and squashes are just starting to sprout their first proper leaves, so they’ll be off out into one of the cold frames soon, to toughen them up prior to being planted out into the garden. In addition to my regular range of flowers, fruit and vegetables, I’m trying a few more exotic things. 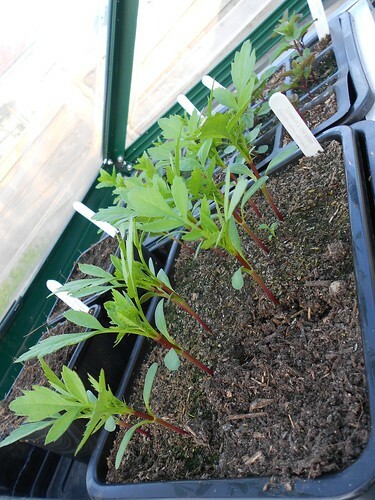 Below are dahlia seedlings, freshly pinched out to encourage them to be short and bushy rather than tall and lanky. (My garden, being long and narrow, has the characteristics of a wind tunnel.) I’ve read in James Wong’s book ‘Homegrown Revolution‘ that you can eat dahlia tubers, so I’m keen to try this out. At James’s suggestion, I’m growing cucamelons, electric daisies, inca berries, alpine strawberries, elephant garlic, quinoa, mooli and watercress, too. I’m also trying to give my regular outdoor vegetables a bit more of a chance against the slugs by starting them off in little plugs, which I’ll plant out once they’re a decent size. And with the winter here lasting until about two weeks ago, planting out directly hasn’t really been an option. 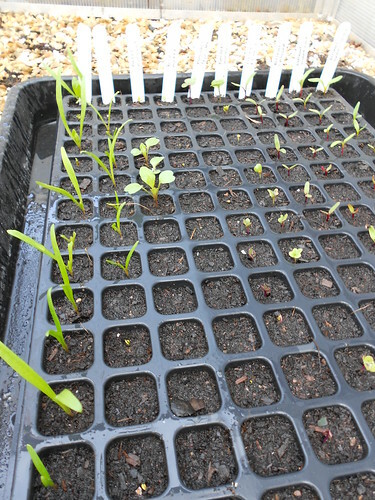 I can sow a second batch directly into the beds now, though, and can see how they compare with the plugs. I have a slight tendency to focus on my vegetables at the expense of my other plants, so I’ve been careful to look after the non-edibles, too. 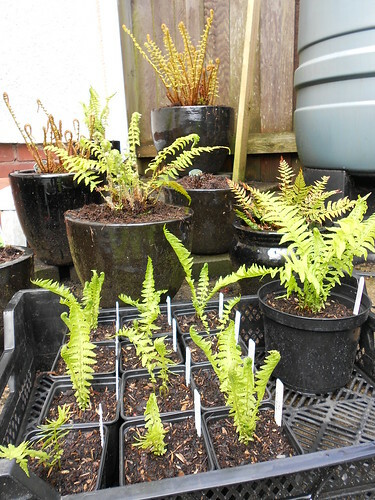 For example, I’ve trimmed the dead leaves off my ferns and have potted up the little offshoots that have sprung up. I’ve also taken the significant step of pruning the older stems off my Euphorbia rigida, a rather messy job that I’d been putting off for several months. Needless to say, once I’d found my gloves and dug out the secateurs, the pruning itself only took ten minutes. The feeling of achievement that accompanied it, though, lasted significantly longer. 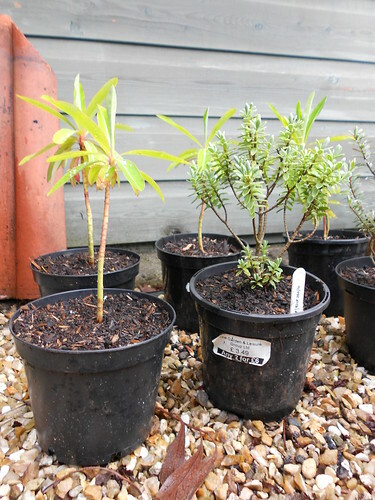 Ditto for having tidied up and potted on the various Euphorbia and Hebe cuttings that I’d accumulated at the bottom of the garden. I’d taken loads of cuttings about two years ago, potted them up and then left them to go feral on the gravel between the willow hedge and the shed. I’d felt really bad about neglecting them, but clearly not bad enough to actually do anything about it. Well, now it’s done. I had to ditch some of them but the rest are looking good, even if I do say so myself. I’ve even made seed bombs. 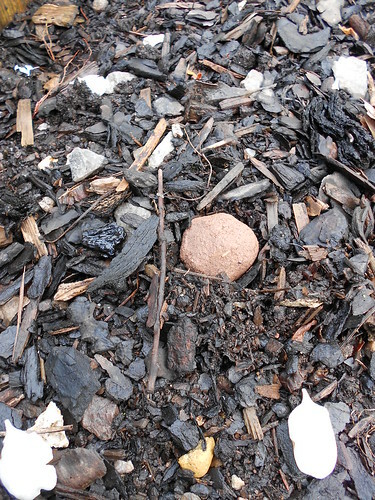 Yes, seed bombs. 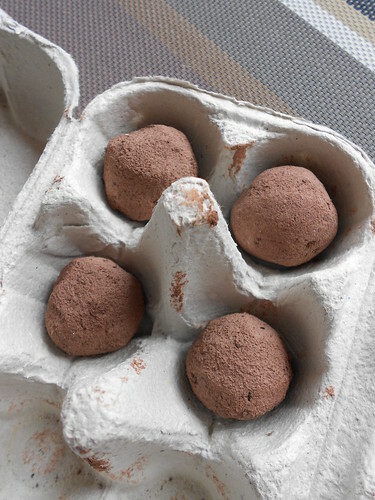 I bought a book on making wildflower seed bombs (‘Seedbombs: Going Wild with Wildflowers’, by Josie Jeffery) some time ago, together with a bag of clay powder that has been sitting in the living room ever since. So one morning last week, I put on an old jumper and got my hands (and the jumper, the shed and the dog) dirty making seed bombs. (And yes, I was careful to use native, non-invasive flower seeds.) Here are some of my inaugural batch. And here’s my first test subject, nestling into the bark chip underneath one of the apple trees by the vegetable garden. I’ve also cautiously ‘planted’ a few on some of my regular dog walking routes around town, so that I can see how well they fare. Exciting stuff. So while I’m not a farmer and probably won’t ever be a farmer, I’m trying to bring a little of the farming ethos into my life. Nothing excessive, just a small amount of planning, a tiny bit of coordination and a little hard work every day. Welcome to the micro-farm. I don’t want to give the impression that all I do is bake stuff and then eat it, though that does seem to make up a large part of my life. 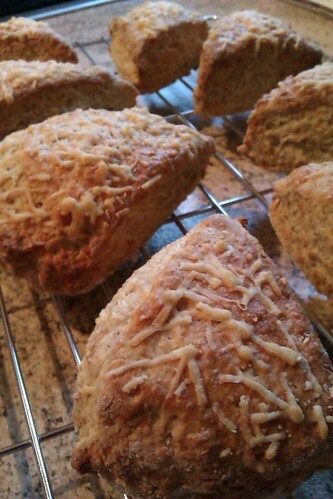 But I am particularly proud of these cheese scones that I rustled up to go with a chilli. Very tasty. And incredibly quick to make. I’m still plucking up the courage to try my hand at croissants, but I definitely need to to something with all of the butter I have left in the fridge. Any suggestions gratefully received. Having had a nice long weekend over the Easter break, I decided to do a bit of baking. 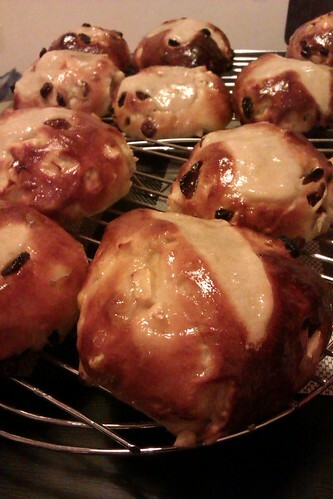 And the logical thing to start with was some hot cross buns. So I got out some of my baking books, found a recipe that I liked the look of and got on with it. It took a little while, as the dough needed to rest after I’d done anything with it, but pretty soon I had some fairly respectable buns ready to go in the oven. I even made a flour paste to decorate the tops. But I got bored with crosses after the first couple, so splurged a variety of letters and random shapes onto the rest. This means, I guess, that they’re technically not hot cross buns, but rather just hot buns. But I can tell you one thing: once they’d come out of the oven, they smelled – and tasted – delicious. The floppy anaemic ones we get from the supermarket quite literally paled in comparison. Clearly, they’re long gone now. But, mmm, they were yummy. Even if I do say so myself. Next up: croissants. Anything that involves battering a block of butter with a rolling pin (honest, that’s what it says in the book) has got to be worth a try. I’m a big fan of the ‘slow’ movement. For those not familiar with the concept, ‘slow’ is about doing things mindfully, taking the time to focus on what we are doing and making a conscious effort to do it well. ‘Slow food’, for example, encourages people to choose fresh, high quality ingredients, to cook them with care and to take the time to enjoy eating them, preferably with family or friends. This approach has spread – slowly – to other disciplines, so that we are now starting to see things such as ‘slow cities’, ‘slow working’ and, indeed, ‘slow living’. Often dismissed as a new-age, lefty indulgence, it is, rather, a welcome rally against the cult of speed that threatens to take over so many aspects of our lives. For adherents of slow, life is something to be savoured and enjoyed. The journey is as important as the destination. One of my favourite slow concepts is that of ‘eigenzeit’. It comes from the German ‘eigen’, meaning one’s own, and ‘zeit’, meaning time. The idea that everything, if we are to do it well, requires a certain amount of time. Now, the particular amount of time required clearly depends on the specific task in hand, but if you try to do it any quicker than its ‘eigenzeit’, then you will inevitably do it badly or not at all. Take my garden, for example. I know that it’s going to take me an hour to cut the grass, if I include trimming the edges and tidying up the clippings afterwards. I’ve done it quite a few times now and it has never taken me less than an hour. It sometimes takes me more time, particularly if I’m having an off day or stop to chat with my neighbour, but never less. Now, I could save time by only cutting the more visible parts of the lawn, by leaving the edges to fend for themselves or by not bothering to tidy up afterwards. But that’s not ‘cutting the grass’ as I’ve defined it. My task has an eigenzeit of sixty minutes. It’s a fact. In a similar vein, I would like to propose the concept of ‘eigenkosten’. We already know what ‘eigen’ means, and ‘kosten’ is German for – and you may be able to guess this – costs. If we are to produce a good or a service to a certain standard of quality, there is – in my view – a minimum amount that it must cost. We might be able to shave a few pounds off here and there by being more efficient or whatever, but we will eventually reach a point where we can’t cut costs any more. That’s the ‘eigenkosten’. If we try to drive down the cost of something below its eigenkosten, bad things happen. Some producers will just stop what they are doing and go off and try something else. We’re seeing this at the moment in the dairy industry, where farmers are selling off their herds due to the unrealistically low price that they are able to get for each pint of milk that they – or, rather, their cows – produce. Alternatively, producers might simply struggle on, making a loss on what they do, in the hope that something will turn up or that circumstances will change. Or they might change the goods or services that they provide, sticking to the ones that they can afford to deliver or reducing the quality of what they produce. This is the situation, for example, in local government across the UK, where funding cuts are having a direct impact on the nature, scope and quality of public services. Sometimes, however, producers will opt to respond to cost pressures by trying to hoodwink us. They will cheat. They will reduce the cost of their goods or services below the eigenkosten by using sub-standard raw materials, by cutting corners in production or by claiming to have done things that they have not. It is looking increasingly likely that this is what is happening across Europe with the substitution of horse-meat in beef products, for example, but this is hardly the only instance where producers have responded in this way. The slow movement tells us that we need to think carefully about how much things cost to produce and how much we are willing to pay for them. We need to be prepared to pay a fair price for the things we need and to challenge those who seek to do otherwise. We need to recognise that everything has a minimum cost – its eigenkosten – and that to seek to drive prices below this is to pay disrespect to the goods and services that we consume, as well as to those who work hard to produce them. When it comes to Christmas, my thoughts turn immediately to food. 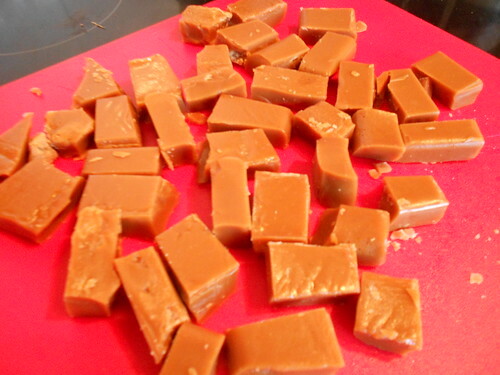 But I know that if I make a big tin of fudge or toffee, I’ll inevitably end up eating it all myself. (This is, apparently, a Bad Thing.) So I decided at the weekend that I’d make a selection of sweets and send them to the various members of my family. 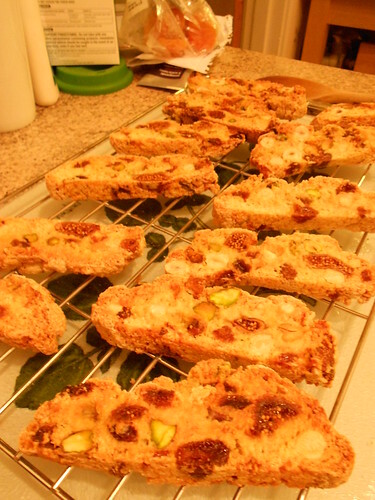 I started off with biscotti. This gets baked twice, once as a loaf and for a second time once it’s been sliced into biscuit-sized portions. Mine wasn’t as crunchy as I’d have liked, as the temperature control in the over seems to be playing up, but it wasn’t too bad for my first attempt. Here’s the finished product. I then moved on to fudge. I’m a big fan of the Roly’s Fudge franchise and buy a big bag of their fudge whenever I’m near their shop in Sidmouth. 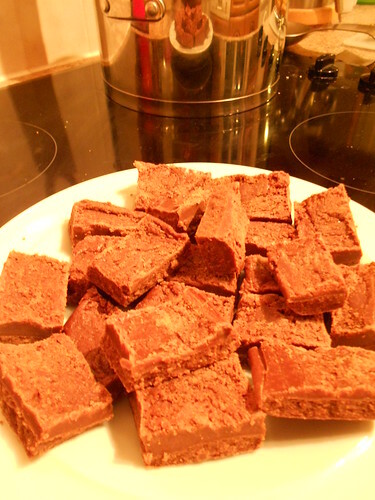 I’ve never been able to replicate Roly’s fudge at home, though, so was very excited when I found a recipe on the internet purporting to be theirs. Needless to say, it wasn’t. But I did end up with some rather crunchy, chocolately fudge. Here is it. 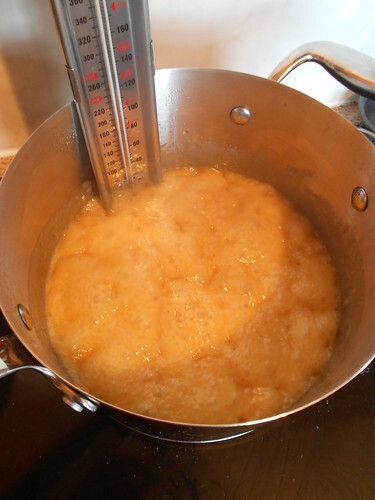 Eager to get at least one thing right, I turned to one of my old favourites – white chocolate fudge. When you mix sugar, double cream and white chocolate, it’s very difficult to go wrong. And the result is delicious. 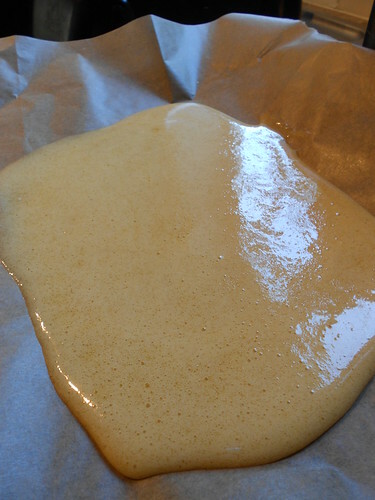 This is the only fudge recipe where I use liquid glucose, and it gives the mixture a very silky texture. Here it is on the boil. And here’s the fudge itself. I really should chop it into tinier pieces. My brother-in-law once had three chunks of this at one sitting and was on a sugar high for about a week. 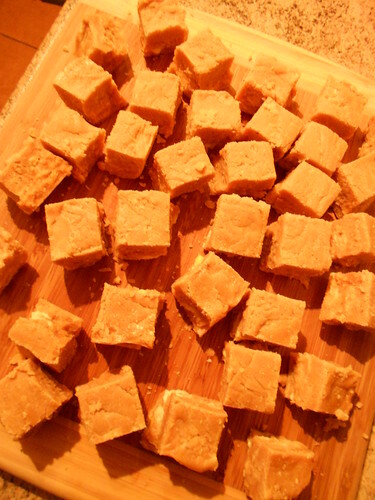 Last up was a recipe that I’d tried before but not really been very happy with : Hugh Fearnley-Whittingstall’s vanilla fudge. This time, though, I followed the recipe very carefully and let it stand to cool in all the right places. And the result was divine. Sorry I doubted you, Hugh. 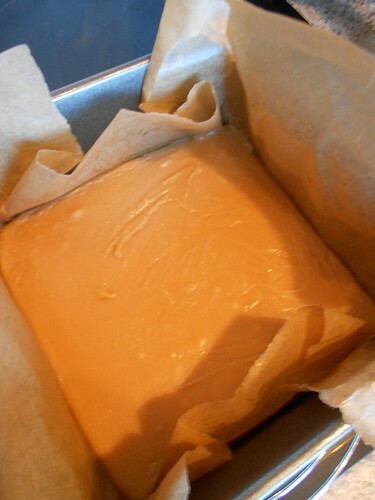 Here’s the fudge cooling in the tin, waiting to be sliced into squares. A very productive afternoon. And immense fun. I hope my family enjoys eating these sweets as much as I enjoyed making them. I’ll have to make some more, now, so that Natalie and I have something for Christmas, too. I’ve done it again. I’ve got a little bit carried away with my seed-sowing and I have far more plants than I know what to do with. I do the same thing every year and each year I promise myself (and Natalie) that next year it will be different. And now I have a greenhouse, three cold frames and part of a garden full of little pots of plants that are looking for a loving home. I could claim that it’s not my fault. I plant a few extra seeds in case they don’t all germinate and, when they inevitably all do germinate, I can’t bear to discard any of the tiny seedlings (I mean, they’ve kept their part of the bargain, so surely I have to keep mine) and pot them all up. What kind of heartless gardener would throw away perfectly good seedlings? A sensible one, probably, so we’ll move swiftly on. Regardless of fault, the upshot is that I now have more plants than you can shake a stick at. 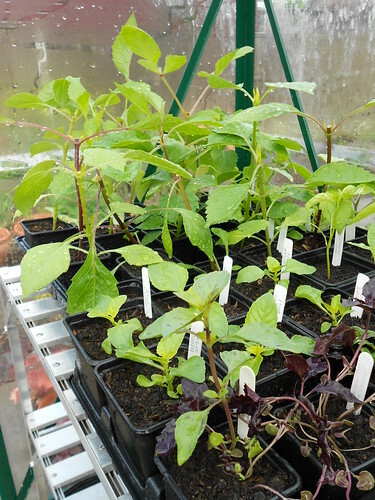 I’ve got six varieties of tomatoes, two sorts of mint, loads of tagetes, four varieties of chilli, four or five sorts of courgette, ipomoea, mina lobata and more. Oh, and squash. Lots of squash. Over the last few weeks, I’ve been doing my best to rehome them. 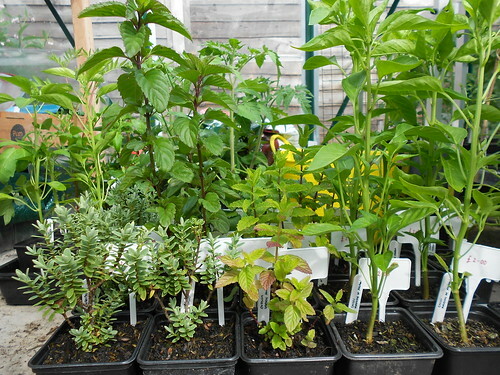 I’ve had a stall at my local country market, I’ve given some to my neighbours and I spent last Saturday morning selling some of them off at a plant sale in the town centre (total takings: £19). My wife has also got on the case, securing orders from several of her work colleagues (who benefit from a very generous 100% discount). I’ve manage to find homes for about two thirds of my surplus stock so far, and will be off to market again tomorrow morning with the rest. On the basis of experience so far, I suspect that I may be bringing a fair few of them back home with me afterwards, so I will have to think of a further plan for any stragglers. 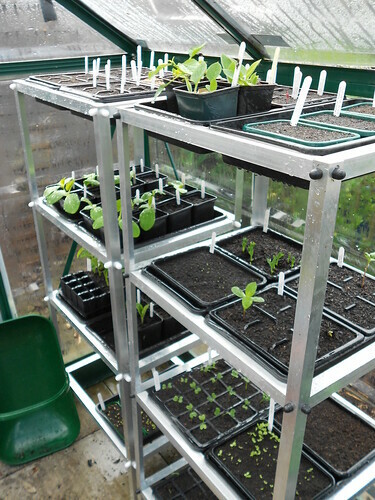 But anyway, there’s gradually a bit more space appearing in the greenhouse and the cold frames, which will give me room to pot up and grow on the other seedlings that I have yet to plant out. I know, I know – I’m doing it again. But the little fellas have done their bit and now it’s my turn. I shouldn’t have planted so many. I’ll do better next year. I made my first foray into the nursery trade last Friday, when I packed up a dozen of my home grown plants and headed down to my local Country Market. 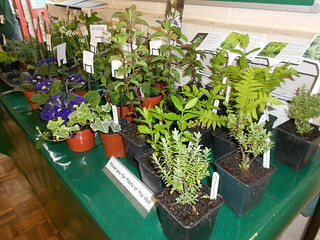 And I even made my first sale – one of my shuttlecock ferns was snapped up within minutes. Sadly, nothing else happened for the remaining hour and a quarter, but even Bill Gates and Steve Jobs had to start small. In case you’re not familiar with Country Markets, and I suspect that you are not, let me tell you a little more. They were founded by the Women’s Institute as a way of helping people to offload their surplus home produce and to make a little money in the process. There are markets in most towns and villages, selling a range of food, crafts and plants. Everything you will find there is locally produced, assessed against stringent quality standards (and I know, because I have, in fact, read the manual) and home-cooked, home-made or home-grown. The plant stall, with my own contribution in the foreground. I would be surprised that the markets are not more popular, but the one I went to is held for just over an hour on a Friday morning, in a church hall just outside the town centre, with very little in the way of fanfare or advertising. So, to be honest, I’m quite surprised that anybody manages to find it at all. 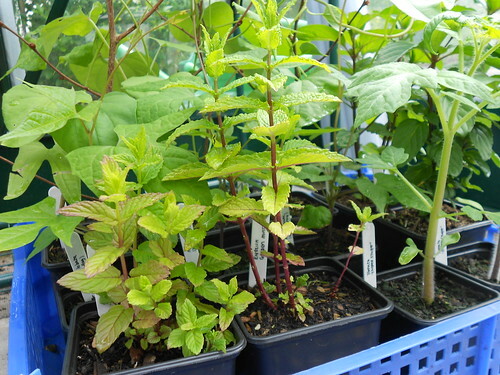 Anyway, I picked out the most aesthetically pleasing of my current crop of young plants (four each of shuttlecock fern, moroccan mint, hebe pinguifolia and garden mint) and took them along. My first thought was that I was clearly not in the market’s core demographic. For one thing, I was (and still am, for that matter) a bloke. And for another thing, I’m (quite a lot) under 65. But the market controller introduced me to the other producers and everyone made me feel welcome right from the start. 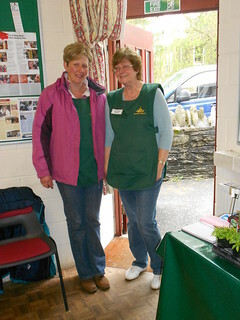 Jane (left) and Heather, my fellow plant-sellers. There were two other people there with plants to sell, Jane and Heather, both of whom have been involved with the market for some time and were, consequently, able to guide me through the various requirements in terms of labelling, filling in my record sheet (to make sure I get paid) and presenting my plants to best effect. Apparently, trekking a load of mud into the hall and then leaving your plants to dribble water all over the stall while you wander off in search of a cup of tea is not how things are done. Because the market is a cooperative, everyone works together to set everything up (the real reason people were so happy to see me, I suspect, given the number of tables and chairs that needed lugging around), engage with customers, sell things and tidy up afterwards. There are communal tills for the different sections (food, craft and plants), which explains the need for detailed records of who has brought what and how much they are left with at the end, with producers receiving their takings (less a 10% commission) once a month. And with my one solitary plant sold, I have made a grand total of £2. Less commission, which brings it down to £1.80. Clearly, this is unlikely to become a major earner any time soon. But it will hopefully be a useful way to get rid of some of my surplus plants (which I just can’t stop growing) and to introduce people around here to something other than petunias. It was also, to my surprise, excellent fun. I may even be slightly addicted. I’ll definitely be there again this week. I’m starting to detect a slight problem with my food-growing exploits. 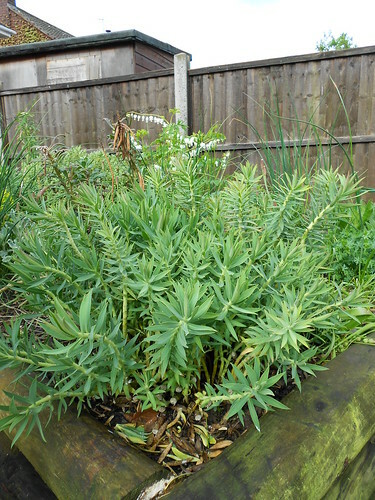 Nothing to do with the plants themselves, fortunately, which are growing well and looking good. In fact, I’ve started to refer to our garden as ‘the micro-farm’, in anticipation of this becoming a recognised (though haphazard) model of agriculture at some point in the near future. No, the problem is definitely me, rather than my future foodstuffs. It started on Sunday evening, when I packed my bag and headed off to London, in preparation for a seminar that I was delivering on Monday morning. 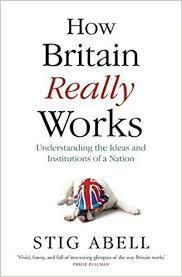 In itself, of course, no big issue (provided we brush over the fact that I was going to work at the weekend). But before I left, I was compelled to leave Natalie with a detailed list of care requirements for my various seeds, seedlings and young plants. I’ve spent the last few years learning about how best to grow the various fruits, vegetables and flowers that I enjoy, and try to make sure that I look after them well. I’m used to doing the rounds first thing in the morning and in the early evening, watering the crops and checking for bugs, as well as generally keeping an eye on things during the day if I’m around. So the thought of leaving them alone, with (let’s be honest) essentially a substitute teacher in charge, was harrowing in the extreme. I guess this is the problem when you have living things of any form, whether plants or livestock, that require daily attention. You get into a routine of caring for them and then need quickly to come up with a Plan B when other things demand your attention, such as the job that actually pays for you to own the garden and the plants and everything else. And then you end up in London first thing on a Monday morning, trying to deliver a seminar to a roomful of serious people, when all you can think about is whether or not your wife has remembered to water the courgettes. This time of year is known traditionally as the ‘hungry gap’, when the winter vegetables have finished and the summer ones have yet to make an appearance. Which is why I’m deriving huge (and perhaps unwarranted) amounts of pleasure from the fact that yesterday, for the first time this year, we were able to tuck in to some of our produce from the garden. I mustn’t get carried away here, because it wasn’t a whole meal or anything. But it’s a start. And having spend the last couple of months preparing the soil, planting seeds and caring for the growing plants, it’s nice to get a return on my investment. Especially because I know that from now until the depths of winter, my hard (but incredibly enjoyable work) will result in fresh, healthy food for our plates. 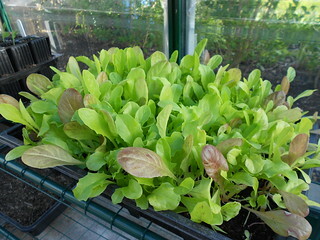 First up was a delicious home-grown mixed salad to go with our main course, bringing together the baby salad leaves that I have grown in the greenhouse, together with some tender pea tips and a couple of leaves of succulent wild garlic. It was just a small selection of leaves with a bit of olive oil and some balsamic vinegar, but the perfect start to the year’s harvest. 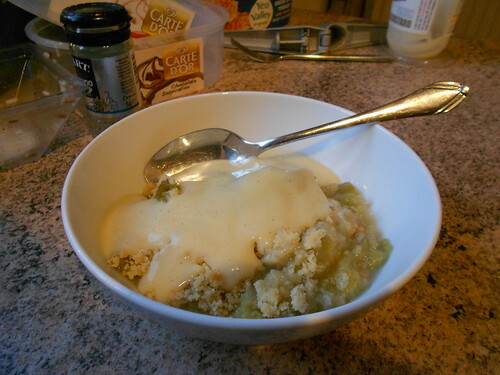 In case this doesn’t seem as impressive to you as it did to me, let me move on to dessert, for which we rustled up my all-time favourite: rhubarb crumble and custard. 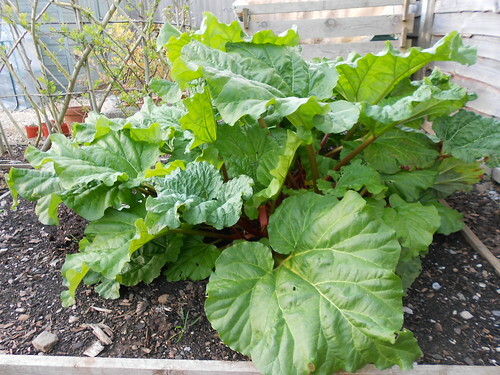 We have a big rhubarb plant at the bottom of the garden that is getting more rampant each year, and this season’s stems had finally got large and numerous enough that we thought we’d harvest some. And, boy, were they delicious. Definitely a most excellent start to the year. And with a whole host of other fruits and vegetables either growing away or waiting to be sown, there’s much more to come. Enter your email address to follow my blog and to receive notifications of new posts by email.